Klumpke's Palsy is defined as a form of brachial palsy known to affect newborn infants. It is also referred to as Klumpke's paralysis and/or Dejerine-Klumpke palsy. Klumpke's palsy is a birth injury that occurs as a result of the brachial plexus nerve being injured, specifically at the first thoracic nerve (T1) and the eighth cervical nerve (C8), before or after the two have joined together to form the lower trunk. This rare injury to the brachial plexus results in partial paralysis of the muscles found in a baby's hands and forearms. In simple terms, a brachial plexus injury is one where the upper spine sustains nerve damage and may result in a loss of control and sensation in the forearm and hand that is controlled by the injured nerve. Klumpke's palsy affects roughly 1.45 out of every 1,000 births. The brachial plexus injury is usually a result of a birth injury that comes from extremely difficult vaginal deliveries, often where the baby is larger than normal (macrosomia) and/or the mother is fairly small. The most common of Klumpke's palsy is a hyper-abduction injury to the child's arm that has the sufficient intensity to traction the lower brachial plexus. Klumpke's palsy is often a result of a delivery complication called shoulder dystocia in which the baby's shoulder gets stuck on the mother's pelvis. When this complication arises the baby is often injured when the physician pulls the baby out of the birth canal by extending its arm above the baby's head in a manner that is performed too roughly. Other methods of dealing with a difficult vaginal delivery that can result in this injury include excessive use of vacuum extraction, failure to perform an emergency caesarean section, and the improper use of forceps. When this occurs, there are four different types or levels of injury to the brachial plexus nerve that may occur. Avulsion: an avulsion injury may occur where the nerve is completely severed from the spine. Rupture: a rupture injury to may occur where the nerve tears, but not at the location where it is connected to the spine. Neuroma: a neuroma may occur, where the injured nerve heals but is unable to send nerve signals to the arm or hand muscles because a buildup of scar tissue that increases pressure on the nerve has developed. Neuropraxia: neuropraxia or stretching may occur, where the nerve has sustained damage but is not torn. The majority of Klumpke's palsy cases result from an injury sustained by neuropraxia. The risks of Klumpke's palsy can also be increased by delivery complications such as excessive fetal weight, gestational diabetes, prolonged deliveries, breech births, and abnormalities in the mother's pelvis. Klumpke's palsy is very similar to Erb's palsy, another condition that is predominantly associated with birth injuries. It is possible, however, for older children and adults to develop Klumpke's palsy if the C8 and T1 nerves become injured. While Klumpke's palsy and Erb's palsy are similar, they are often confused. The difference is the portion of the brachial nerve that is injured and where the symptoms occur. While Klumpke's palsy affects the lower portion of the brachial nerve (T1 and C8) and predominantly affects the forearm and/or hand, Erb's palsy affects the upper portion of the brachial nerve (C5 and C6) and affects the either the upper and/or entire arm. Additionally, Erb's palsy occurs at a higher rate than Klumpke's palsy. Symptoms of Klumpke's palsy vary depending on what the specific injury to the brachial plexus was. However, no matter what the injury sustained was the intrinsic muscles of the hands and flexors found within the wrists and fingers are affected. In the most severe cases, patients will have what is called a "claw hand" characterized by the affected forearm lying flat while the fingers and wrist are tightened. Other symptoms that could be seen include Horner's syndrome characterized by drooping eyelids of the opposite side of the face, numbness in the affected hand or arm, stiff joints, muscle atrophy, a paralyzed or limp arm, severe pain, weakness in the affected arm, the inability to use muscles within the affected arm, and C8/T1 Dermatome distribution numbness. 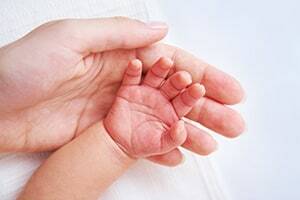 In a number of Klumpke's palsy cases, the baby will recover on its own within six months after birth usually with return of arm and hand function between 90-100%. However, in more serious cases, like when an avulsion occurs, the T1 and C8 nerves may sustain permanent damage where the consequences could remain for years and potentially result in disabilities of the arm, hand, or fingers that last a lifetime. Treatments that are common for Klumpke's Palsy injuries are similar to those for other brachial plexus injuries and can include pain medication, physical therapy, and nerve grafts or surgical procedures in the most serious cases. Surgical procedures are often first needed to repair the damaged nerve and then later needed again to remove the buildup of scar tissue. If the scar tissue is left unremoved, nerve function may be increasingly impaired.